This video and the description included in this post were submitted by members of Nevada Cop Block, who regularly attend Food Not Bombs Las Vegas Picnics to counteract and document the harassment that people participating in the twice weekly events often face from the employees of the Deputy City Marshals of Las Vegas and other Law Enforcement Departments, such as the Las Vegas Metropolitan Police Department. Las Vegas Police have a long history of targeting homeless people, as well as those who attempt to aid them through non-government methods, such as Mutual Aid. In fact, in 2006 Las Vegas was one of the first cities in the country to make it illegal to share food with hungry people and several members of Food Not Bombs Las Vegas were either cited or arrested, as a result. The ban on sharing food with hungry people was overturned fairly quickly, in large part because the law stated that people could not share food in public with “someone who appeared to qualify for government assistance” (I.E. people that look like they might actually need food). However, harassment toward homeless and impoverished people within the Las Vegas area continued in different ways and is still a very common occurrence today, both inside and outside of the local public parks. As you can see in the video above, the Las Vegas Deputy City Marshals don’t even bother to hide their arrogance, hypocrisy, and disdain for the citizens of Las Vegas. 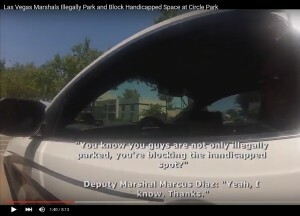 Make sure you don’t forget to contact those within the Las Vegas City Government to let them know what you think of these marshals parking illegally blocking the handicapped parking space in a public park and then saying that that’s just “how it goes” if a disabled person comes along and needs to park. 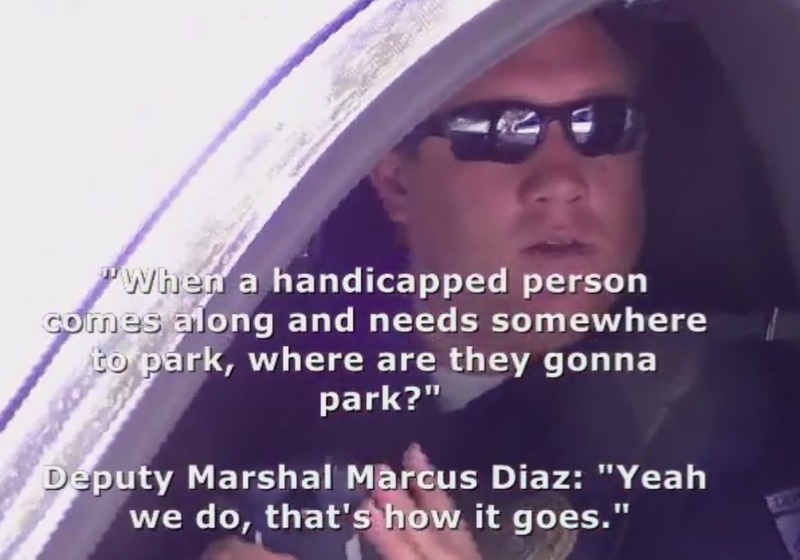 Later, Deputy Marshal Diaz stated, “that’s how it goes,” when asked what handicapped people were supposed to do if they came to the park and the space designated for them to park was blocked. 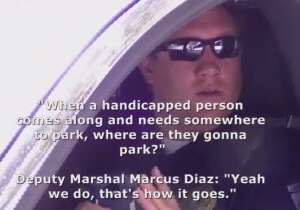 The other Las Vegas Marshal claimed he was there responding to a call about us being in danger and needed to park blocking the handicapped space in case he had to come rushing to our rescue. The fact that he never contacted us or said anything to us prior to us confronting him about their illegal and immoral parking proves that was a (bad) lie. He also tried to claim that they weren’t obstructing the handicapped parking area, which as you can see in the video is an even worse lie. Officers Involved: Deputy Marshal Marcus Diaz and one unidentified Deputy Marshal, who was driving vehicle #3885 at the time. 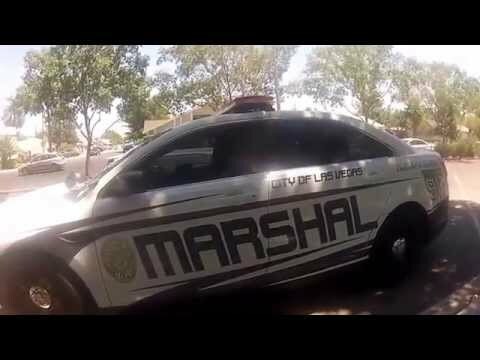 Full, unedited raw video by four different members of Nevada Cop Block.